African Penguins are the only species of penguin to inhabit the African continent. Although temperatures along the coastline of Africa are relatively warm, the ocean currents the penguins inhabit are cold. These penguins have layers of fat and water-proof feathers that help keep them warm and insulated in the water. To stay cool on land, the penguins pant and raise their wings away from their sides to help release heat from their bodies. African Penguins regularly preen themselves, rearranging their feathers to clean off dirt, ticks and parasites, preening also distributes natural oils to ensure insulation and a water-proof quality. African Penguins are often observed engaging in allopreening (preening each other) because penguins can have a difficult time preening their own heads and necks. 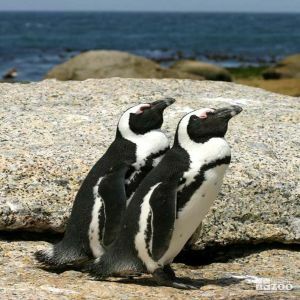 African Penguins are monogamous. On average the female will lay 2 eggs per season, which both parents will care for over a period of 40 days. African Penguins have a bare patch of skin on their lower bellies called a brood patch. The brood patch helps keep the eggs warm and protected while they are incubating. The chicks are born with fluffy down-like feathers and are unable to hunt for food for themselves. Parents will continue care for the chicks for another 30 days, watching over them and alternately hunting for fish and feeding them by regurgitating the food into the chick’s mouths.